California Watchdog.org attempts to determine the reverberations of the passage of Senate Bill 185 (De Leon), which directs how the state’s pension funds should manage assets with regards to coal. Senate Bill 574 (Pan) was on the Senate Floor just three days prior, which would have required more disclosure on alternative investments for the University of California pension system. Let me provide the drama. For SB 574, on the Floor, I inquired of the author if the requirements he was imposing on the UC pension system were different than those that were required of CalPERS and CalSTRS. Senator Pan, from Sacramento, stated that his bill would require the UC system to mirror the policies of the state’s largest two systems. I also asked about particular money managers, like Kleiner Perkins and Sequoia. I was told that they were in the two state systems and were complying (see https://youtu.be/_BMHk-SRdas). Consequently, instead of opposing SB 574, I voted to support it. Regretfully, it was under a false premise, which I’ll explain later. It is a little more daunting to address a bill that is authored by the President pro Tempore of the Senate, like SB 185. But, after he presented his bill, I stood up on the Floor and reminded my colleagues that I had the privilege of sitting on the Board of one of the largest pension systems in the nation for twelve years. I then stated that the primary rule in a pension plan is to invest for value. I then stated that the two money managers that I inquired about on SB 574 were no longer with CalPERS and CalSTRS. That the answer that I was provided by the Senator from Sacramento was not accurate. The fact that these two money managers were gone proved my point: meddling and requiring more disclosure of private equity investments was a way to scare off astute money managers that did not want to reveal trade secrets. "Leave the management of portfolios to the Chief Investment Officers . . . I encourage a ‘No’ vote (on SB 185)." SB 185 passed with 24 votes. All of the Republicans voted against, except for Senator Nielsen, who did not vote. Senator Roth voted against the bill and Senator Hertzberg also did not vote (a subtle way of opposing the bill). I know that I am in the weeds here, but that’s my job. And I’m happy to explain and defend every vote that I make. And, on those occasions when I do lift my microphone, I’m happy to relate my arguments, either for or against, a certain piece of legislation. Would the public employee unions have heart burn over this bill? My response was, "no." The investment holdings in coal were minimal, only $83 million. What the piece below does not mention is whether this is the cost or the current market value. If it is the cost, and it is sold for $83 million, then there is no loss and no story. If it is the cost basis and it is sold for more, there is a profit. If it is sold for less, in a fire sale, then losses are sustained. It is easy to understand that forcing a sale is imprudent. The public employee unions are the ATM for the Democrats. That makes them very influential in Sacramento. If they really had a problem with this bill, they would have had it killed long before it reached the Senate Floor. As one of the few legislators who has served on a pension board (probably the only one – I’m not aware of any other current legislators who have been on a pension board), let’s hope that my counsel will be given more credence in the future. But, when the President pro Tem authors the bill, it has to be very difficult for my colleagues on the other side of the aisle to oppose his efforts. 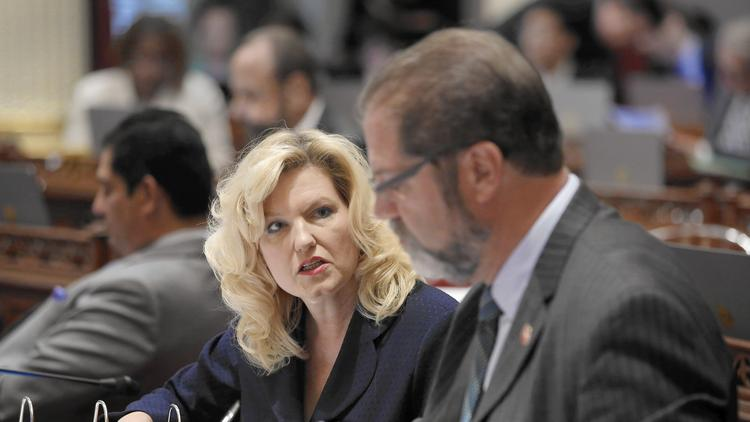 The second piece is on the website of the LA Times and covers the current intrigue about the re-election efforts of my seatmate, Senator Cathleen Galgiani. I enjoy sharing a paired desk with her and we have established a healthy relationship. We enjoy good discussions and she has a fantastic sense of humor. The difficult component of building good relationships with those on the other side of the aisle is that I will have to support their opponents in the upcoming election cycle. The piece provides another perspective on the power base known as the "third house." Lobbyists and businesses contribute to candidates and incumbents who share their interests and if they have a member who will vote with them when they need it, they will generally continue to support that candidate. And they must be communicating that they have built a good relationship with Senator Galgiani. The fun and intrigue never seems to stop. At least you can obtain a glimpse, from another angle, of my new world. No coal will likely translate into less money for the nation’s largest pension fund for state employees. But at least for now, it appears the unions representing members of the California Public Employees’ Retirement System aren’t kicking up a fuss about the potential financial hit from a law calling for CalPERS to sell its holdings in companies that derive at least 50 percent of their revenue from coal mining. Last month, Gov. Jerry Brown signed a bill calling on state pension funds to divest from 24 coal mining companies that have $83 million in holdings. The law also affects the California State Teachers’ Retirement System. CalPERS holds more than $300 billion investments, the biggest in the country, while the investments at CalSTRS are worth nearly $191 billion. The divestment effort will probably cost the CalPERS fund millions, according to a financial expert. Andrew Junkin, president of Wilshire Consulting, told the CalPERS investment committee Oct. 19 that previous divestment actions based on political motivations — such as withdrawing from funds in South Africa, Iran and Sudan — cost CalPERS between $4 billion and $8 billion. The $83 million CalPERS holds in coal investments reportedly include thermal coal mining companies Peabody Energy and Arch Coal. With coal companies under pressure from new regulations from the U.S. Environmental Protection Agency, the industry is going through its worst slump in decades and coal companies’market values have dropped nearly 90 percent since 2011. That means divestment will almost certainly mean a financial loss for CalPERS and CalSTRS. “CalPERS has a propensity to get out of markets right at the wrong time,” said Marcia Fritz, a certified public accountant and president of the California Foundation for Fiscal Responsibility, a nonprofit that has developed a reputation as a fiscal watchdog of the California pension system. Despite the potential losses, the response from some of the largest unions in the state has been muted. Watchdog.org contacted some of the other public employees unions in the state, including the 7,000-member California Statewide Law Enforcement Association, the California Association of Highway Patrolmen, the California Correctional Peace Officers Association and the SEIU Local 1000 in Sacramento, but did not receive any responses. While CalPERS pensioners will likely end up losing money in coal divestment, the $83 million holdings in coal represent just 0.00028 percent of the entire $300 billion in the entire CalPERS fund. “It’s a pimple,” said state Sen. John Moorlach, R-Costa Mesa. But Fritz said since California taxpayers pay for state employees and their pension systems, every dollar counts. Moorlach doesn’t like the coal divestment idea, either. Junkin told the CalPERS investment committee the pension can more effectively influence coal companies by staying financially involved with them. Fritz thinks the pensions should pass on divesting from coal. In a statement, CalPERS praised Brown and de León but did not commit itself to definitely divest. Environmental groups have cheered the divestment law. According to the law, a decision on coal divestment has to be made by July 2017. Assemblywoman Kristin Olsen (R-Modesto) said party officials told her that if she runs against Sen. Cathleen Galgiani (D-Stockton), she’ll be getting no help from them. A year from election day, groups such as the California Assn. of Realtors and Chevron have told the candidates and other political players that they’re for Galgiani, a show of support from entities that routinely spend big to back their choices. Jon Fleischman, a conservative Republican activist and former party official, said he believed the party was holding off on the race to appease business interests. The decision, he said, underscored "the party’s dependency on interest groups in Sacramento who do not share the same priorities of the party all of the time." Business support has helped make moderates the ascendant wing of the Democratic Party, able to flex their muscle in such legislative battles as this year’s heated debate on climate issues. But increasingly, business is also siding with moderate Democrats over customary Republican allies. Some corporate interests were furious last year when the Republican Party tried unsuccessfully to unseat Assemblyman Adam Gray, a moderate Democrat from Merced. A group financed by Chevron, the Dental Assn. and insurance agents sprang to Gray’s defense with radio ads knocking his opponent. Republicans in the Legislature serve as a check on the majority party, she said: "Our quality of life and our economy as a state and as a valley would be better off when there’s more of a balance between the two parties," Olsen said. In that race, it was Berryhilll who scooped up most of the business community’s support. One notable exception was the Realtors group, which spent more than $620,000 on Galgiani’s behalf. "Of course we speak to party leaders about all races," said Laiza Garcia, who directs the group’s political action committee, "and no, we did not urge the [party] not to devote resources to [Senate District 5], should Assemblywoman Kristin Olsen decide to run." There’s still potential for a costly showdown. GOP mega-donors such as Charles T. Munger and Bill Bloomfield have been willing to pump millions into independent efforts to help Republican candidates. Olsen said she would make a decision by the end of the year. The lack of party money, she said, won’t be a determining factor.